Welcome to Part 2 of my Sleigh series. 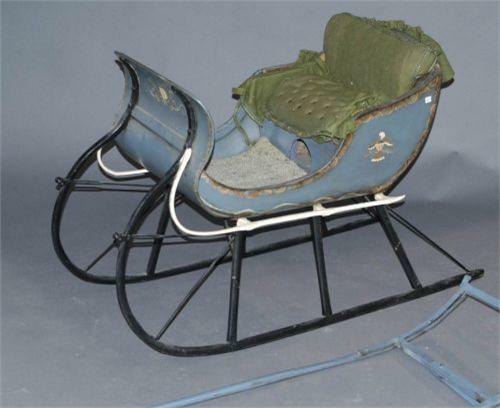 Today the emphasis is on children's sleighs of the 19th and early 20th centuries. 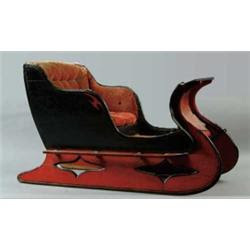 This series isn't to teach the history of sleighs, but to show you examples of what were in use at the time. 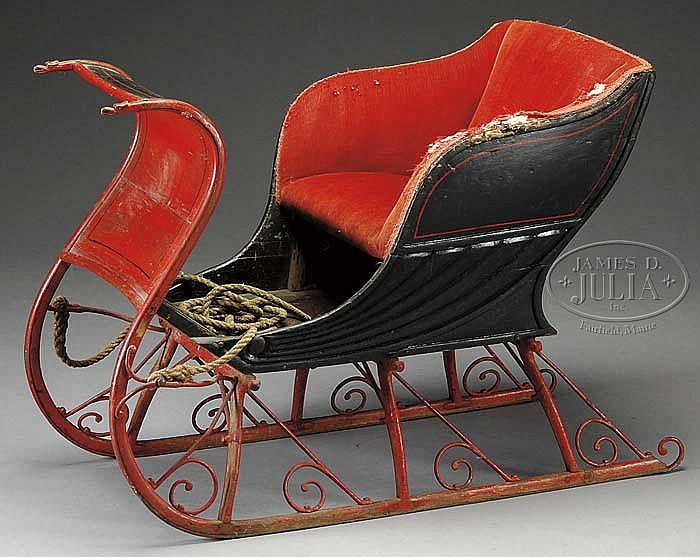 Push sleigh manufactured in1890 by the Paris Mfg. Co out of Paris, Maine. 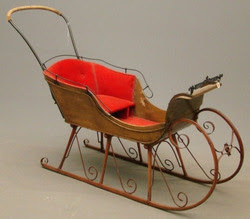 Rubylane.com carries this next child's sleigh. Although it looks similar to the one above, there's one big difference... it's a doll's sleigh. The listing says, "I see no evidence of a seat ever having been present. In my opinion, this was always a toy, meant to be used by children to give their dolls, or perhaps the family kitty a ride." Adorable, no? Or is just that I'm a sucker for anything blue. This sleigh looks similar to the Bentwood sleigh above. 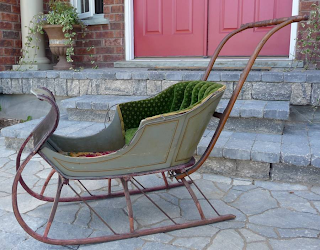 Wendy Hamilton Antiques lists this child's push sleigh as: "This 19th century push sleigh would have been used for a child. The paint and stenciling are original. There is no damage and there are no repairs or replaced parts. It has what could be its original upholstery in great condition. The entire sleigh is just over 3 1/2 feet long. It is 1'6" at the widest and stands 2'10" from the ground at the handle end and 1'10" at the front end. The seating area is 2' 7 1/2" long." Pull sleighs are those pulled by people or small animals like ponies, dogs and goats. The icollector.com site shows this Victorian child's pull sleigh, again in a pretty blue although I'm not sure if the part on the floor is the shaft for pulling or the handle for pushing. 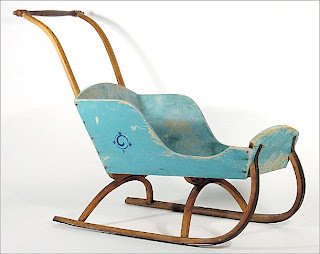 icollector.com also has this differt type of sleigh although it doesn't mention a manufacturer. The only info included is "PAINTED CHILD’S SLEIGH. Upholstered seat and foot area, black painted with red runners. Curving front with interesting cutout runners. SIZE: 24” h x 41” l x 16” d."
It reminds me of the carrioles from Quebec that I introduced in my sleigh post featuring adult size sleighs. 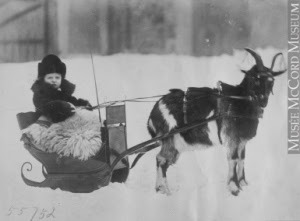 This time from the McCord online museum, we find Young Master Corriveau in a sleigh pulled by a goat. Photo courtesy of McCord Museum. ﻿ This pull sleigh is listed at http://www.invaluable.com/ as "Late 19th century. The upholstered carriage seat with S-curved paneled front continuing to runners with scrolled wrought iron supports. SIZE: 25" h of back x 32" l x 19-1/2" w."
The video is of an older child's sleigh pulled by a miniature horse. I'm working on 2 more posts in this series: one on sleds (Dec 20th) and one on unique and royal sleighs (in January). Last time I asked if you’d ever been on a sleigh ride and I loved that you shared your experiences. This time my question is more basic: Have you ever touched snow? Do you live where it snows regularly or once in a lifetime? i love the sleighs and wish i was still living in colorado so i'd have an excuse to purchase something like that for Guppy. i grew up with snow. for me, the Christmas season isn't quite Christmasy without snow. of course now i've exchanged mountains of snow for the sandy beach of Virginia... still not sure if that was an equitable exchange. Nice post, Anita. Living in Buffalo for most of my life, I've certainly had opportunity to touch snow--although I try to avoid it whenever possible. This year, so far, I've only seen a few flakes and no accumulation. It could stay that way all winter, and I'd be perfectly content with that. In fact, if this is global warming, I think I'm a fan--just teasing. Maybe. The child's push sleighs would be nice--like a winter stroller. I was wondering why you don't see them these days--and then I recalled that you need the snow base, and most of our roads and sidewalks are cleared and salted. Our loss, I guess. They are charming. We actually had a push sled for my sister when she was a baby. Wouldn't do much good here in Virginia, but worked pretty well in Pittsburgh. I've never been on a sleigh ride, but I'd love to. I grew up in Southern Illinois and we played in the snow and went sledding every winter! Lots of great fun. Hey Deb, I hadn't realized you didn't get snow often. I know Inky Gina made a big noise about the snow last year in Richmond - I think that's where it was ? - but from watching the Waltons on TV, I thought snow was more of a regular occurrence. Or is it only because they lived on Walton's Mountain? Did you get photos of Guppy in the snow? I hope so. Especially if you don't get the stuff for another bunch of years. Just to prove to him that he's eaten it, you know. I'm glad you like my post. And I'm glad it made you think of home. I agree about the Christmas snow... if you're raised with it, it doesn't seem like Christmas without it. I can say that with surety because I once spent a green Christmas. I was still on the prairies, but we just didn't have any snow that year. And being cold without the snow - well, it just isn't fair. Barb - isn't Buffalo near Niagara Falls? I can see why you haven't much snow this year... just last week or so Toronto hit 70F. That's just plain wrong for Nov. Especially since I had to cancel my mammogram that day because the hwy was experiencing white outs and hubby said, "No." Alrighty then. There's still plenty of time to snow before Christmas. Really, Dina? Do you have a photo of it? I'd love to add it to the post. So I just looked at a map to confirm that Penn was west of Virginia and goodness! Was I wrong. No wonder you rarely get snow in Virginia Beach. With you, Gina and DebH all in the same area, I'm thinking a visit in ... January could be warranted. Heh. Hey Jessica, nice to see you. That's a fabulous idea to use it in the bathroom for towels. Not only do we both like blue, we think alike because I do something similar under the Christmas tree. I have 2 sleighs about 12"long x 10"high that I bought on Boxing Day one year. (Think Black Friday but on the day after Christmas.) I love them but for years never used them. Finally, I hit on the idea to put them under the tree to hold all those little presents that tend to fall between the bigger ones. Functional and beautiful. I love the effect. Thanks for sharing that tip as it shows sleighs can be used anywhere in the house. And thanks for taking time to drop in and visit. Oh, thank you, CJ. 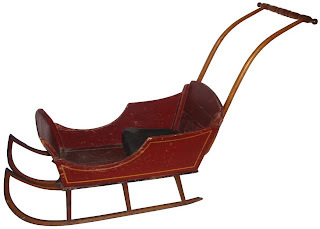 Talking about your dad and the sleigh he used to get to school reminded me I wanted to research that aspect. Up here in the winter, the school bus used to be what they called a caboose. It was an enclosed sleigh - just a box, really - with a little pot bellied stove to keep the kiddies warm. I know they used them, but I'm not sure the time frame. I'll ask you the question I asked Dina... Do you have any photos of your dad with the sleigh and horses? I'd love to do a post using people we know instead of just empty conveyances, you know? I love this series, Anita! What wonderful pictures. I never knew there was such a thing as a push sleigh. Where I live, snow is uncommon but does happen occasionally, and the mountains are close at hand for those who enjoy skiing, etc. I lived in Pennsylvania for three years, so I've had a bit of experience with the joys of watching snow fall. Oh, and shoveling it and slipping down stairs, too. I know--a lot of you are snickering at me! Hey Susie, as soon as you mentioned slipping down stairs my tailbone started to hurt because that's the part I usually land on. Well, except for last year when I fell front first against my ribs and bruised them. Ugh. I always wondered if you lived anywhere else. Having lived in Alaska for some years, I love the snow. The peace of it. The quiet. The way it covers everything (even ugly things) in a blanket of beauty. The way everyone breathes a near-corporate sigh of relief because it's alright to settle down. I miss coming in from the crisp, cold outside to a toasty fire-warmed home. Hearing the scrunch, scrunch, scrunch of friends coming to the door, and big piles of shoes in the entryway (there, everyone takes their shoes off inside). Sometimes, I miss that place so much, I can't think about it. There are many sleds there, too. The most interesting I ever saw was something called a "kick-sled" where someone (or something) sits in front and you stand on the back, kicking it along with one foot. Then, of course, there are the dog sleds, but that is a whole lifestyle unto itself. 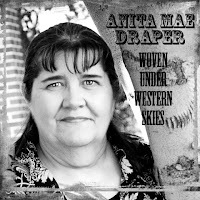 Such an interesting article, Anita -- loved the pictures! Hello Lilly, your comment brought back memories of the Yukon. Oh, I loved that place, too. It's quiet here on the prairie like it was up there, but the piddly aspens here can't even be compared to the magnificence of the conifers up there. So tall, I almost fell over looking up at them. Oh, yeah, shoes and boots piled up in front of the door, along with the hooks and hangars filled with parkas and skidoo suits. Baskets of hats and mittens, both pairs and 'lonelies'. Yup. That's our house. It's interesting that you mention the kick-sled because that's another favourite of mine - possibly because my heritage lies in Finland and the kick-sled has been used forever in the Scandinavian countries. There's a company in Winnipeg that used to sell them and I'd put it on my bucket list to buy one. I'll be checking if they still have it when I draft my post. I love those children's sleighs. I think I have one photo of me on a sled as a toddler. Maybe I was sitting in an orange crate? I'll have to look. Speaking of... it will be fun to see what the Inkies come up with for their 12 Inkies of Christmas. I better start digging through those photos. This is an excellent series Anita! Those bentwood sleighs? oh my! Oh yes, I'm looking forward to the 12 Inky Days of Christmas. Can't wait to see all the old photos of Christmases past. The Waltons lived in the western part of Virginia. Very different climate from the coastal portion. It's mountainous and far enough inland that they have real winters out there. The coastal areas have a climate much closer to that found in the lower South. Anita, I love this. I commented earlier, but "blogger" must have eaten it. I love them all, but especially the first one, the blue one, and my favorite is the one with the cutaway runners. Thanks, Suzie. Do you mean the very first blue one as in the doll's sleigh? Or the 1st child-size sleigh? I like them both, Anita, but I especially like the doll one. It's just precious.